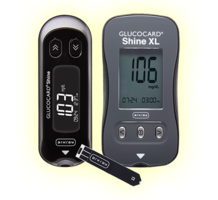 The GLUCOCARD® Shine Express Family Glucose Monitoring Systems are designed for people with diabetes. The devices are audio-enabled and provide testing prompts and glucose test readings in either English or Spanish. They offer pre-meal, post-meal, and fasting test averaging and feature a hypoglycemia indicator that warns user when blood glucose levels are critically low. They allow users to wirelessly transmit data to a smartphone or another Bluetooth enabled device via ARK Care® Vita data management app. MINNEAPOLIS, Nov. 26, 2018 /PRNewswire/ -- ARKRAY USA, Inc., a leader in diabetes care products, announced today the US launch of the GLUCOCARD® Shine Connex Bluetooth® enabled and the GLUCOCARD® Shine Express audio-enabled blood glucose monitoring systems (BGMS). ARKRAY's GLUCOCARD Shine family of BGMS now consists of four distinct meters that use the same test strip platform. "We are excited to make these new blood glucose monitoring systems available to people with diabetes," said ARKRAY USAPresident Jonathan Chapman. "The ability to offer four blood glucose monitoring systems that use the same test strip platform demonstrates ARKRAY's commitment to provide people living with diabetes a wide assortment of tools to accurately test their blood glucose levels, effectively manage their diabetes and keep overall supply costs low." The GLUCOCARD Shine Connex is a Bluetooth enabled meter that provides users the ability to wirelessly transmit data to a smartphone or another Bluetooth enabled device using ARKRAY's ARK Care® Vita data management app--compatible with both iOS and Android devices.